In about 1744, John Wesley first came to Tewkesbury and preached, it is said, under a large elm tree in Perry Hill Field. After that, a room was hired in Long’s Alley, and according to John Rogers this became two adjoining cottages, as a meeting place for Tewkesbury Wesleyans. 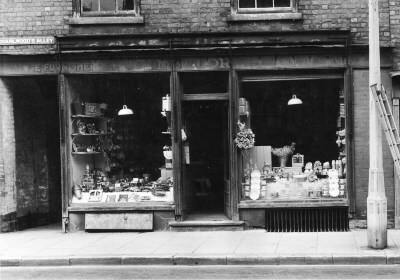 After a few years, the chapel in Tolsey Lane, which is now the Antiques Centre was built and the Long’s Alley property reverted to cottages. Fifty years ago, Tewkesbury needed a new police station, and a site in Barton Street was selected. 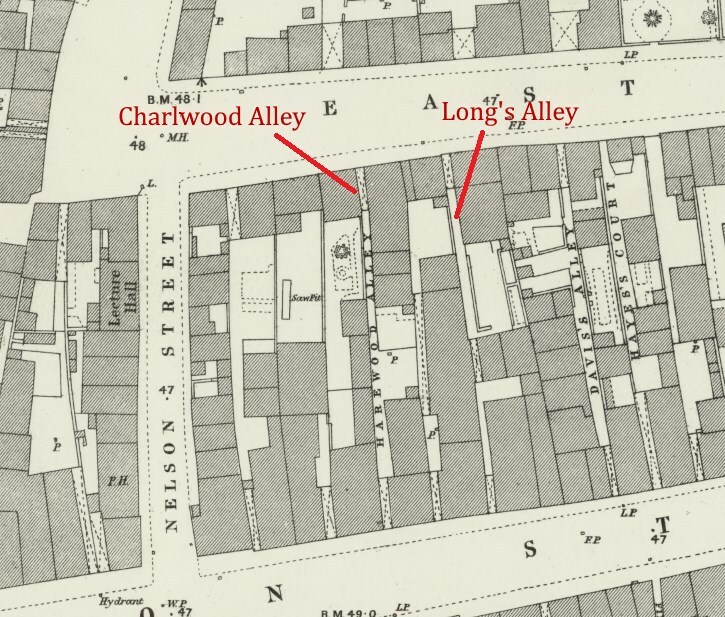 Long’s Alley disappeared in the demolition, and neighbouring Charlwood’s Alley was changed forever by the loss of all its cottages and points of interest. At the same time, through some bureaucratic misunderstanding its official name became Charleswood Alley, though for the purposes this article the old nomenclature is used. Charlwood’s Alley, sometimes called Harewood’s Alley in the past, is apparently named after Isaac Charlwood, described by John Rogers as a tailor and draper, but also as the landlord of the Quart Pot, an inn which used to be at 3 Church Street, later to be the Methodist Minister’s manse. He died in 1837, aged 59. In the twentieth century, the ‘front house’ was occupied by Mellor’s furniture business. Charles Mellor was a Town Councillor, who died in 1935, the business being carried on by others. In 1947, the premises and two cottages were sold to Mr Hampton for £620. A reminder of how recent Universal Suffrage is comes from a ‘Revision Court’ in 1902, when the electoral roll was minutely examined. William Henry Watts claimed a vote as occupier of a cottage in Long’s Alley, but Mr More, acting for the Conservative Party, objected, contending that Sarah Ann Smith owned the furniture and she was the real tenant. Mr Watts didn’t get his vote. At around the same time, the Sanitary Committee were concerned about conditions in Long’s Alley and East Street, and the property owner’s reluctance to remedy the problems, which were about sanitary facilities and standards. After 1903, though, this matter drops off the agenda, so was presumably resolved. Life in these alleys was not as tumultuous as some, with only one prosecution coming to light; in 1885, Robert Hotchkins struck Ezekiel Shepherd a violent blow and threatened to split his head open with a hatchet if he ventured into Charlwood Alley. In 1945, Grace Evelyn Beacher, of 1, Charlwood Alley, took a large advertisement in the personal column of the Echo to say that any person ‘found scandalising her character’ would be prosecuted. There must be a story behind that! Life went on quietly until that fateful decision to relocate the police, and the alleys had to be sacrificed. 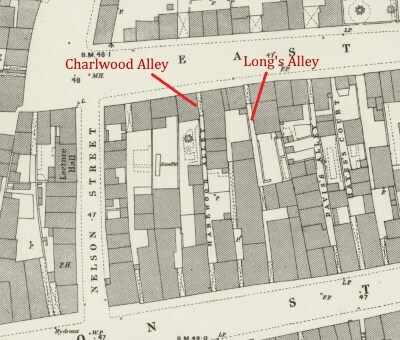 Long’s Alley has gone forever, and Charlwood’s has been turned into a simple short cut between Barton Street and East Street. The Police have moved on now, and the old station has been converted into houses and the area has entered the next phase of its evolution.